Until the 1980s, asset management was conducted on a relatively minor scale, but it then turned into a business like any other, in which the profitability of the service provider itself was paramount. This development had a profound impact on the services themselves, as well as on the nature of the relationship between service providers and investors. Service offers are driven mainly by the high profit they can generate for the service provider. The need to generate higher profits every year, or even every quarter, makes providers focus on the short term. It goes without saying that the client’s interests are pushed into the background. For investors, the detrimental effect of this conflict of interest has worsened over time. On the one hand, a growing proportion of the gains on investments has accrued to providers at the expense of investors, and on the other, the products on offer have become more and more opaque, expensive and unnecessarily complex. Investors are not treated as clients anymore, but merely as product consumers. Furthermore, they have steadily been exposed to all kinds of ideas that are constantly being propagated with the aim of selling them products. In the process, what really counts has been forgotten. This environment, rife with conflicts of interest, short-termism and indifference to the client’s legitimate expectations, explains the generally unsatisfactory performance obtained by investors, and their frustration. It was in response to this diagnosis that we set up MBS in 1990. Our aim is to ensure that our clients’ assets are managed efficiently in their own interests. We have developed a group of transparent, tried-and-tested services which are both easy to understand and effective, thus helping our clients to adopt a position that gives them a decisive and sustainable advantage over other investors. Our clients were therefore able to sail serenely through the bond crash of 1994, the Asian crisis of 1998, the dotcom bubble, the credit crisis of 2008 and the sovereign debt crisis in the Eurozone. Placing the client’s interests first is our company’s guiding principle. Many firms make the same claim. However, their business models reflect a different reality. Ours, by contrast, reflects the way our services are in alignment with our principles, especially with regard to our fees. The exceptional loyalty of our clients bears witness to the quality of our advice and our desire to develop a lasting partnership with each of them. 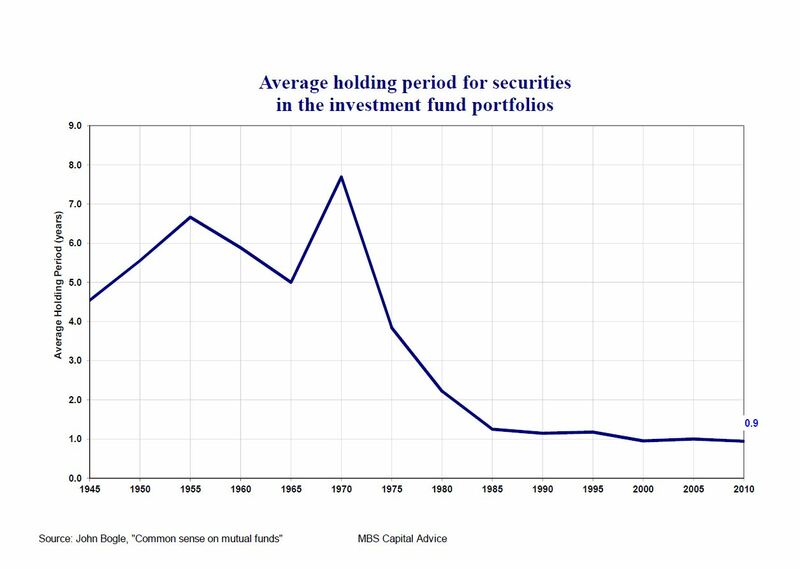 This graph illustrates how asset management has switched from being an activity carried out by the investor to one that is exercised from a speculative perspective. The average time for which securities are held has fallen from six years to less than one year. However, over six years the price trend of a security tends to mirror the change in earnings generated by the company, whereas over less than one year the price trend is primarily influenced by other factors whose effect wears off with the passage of time.